The Disney Culinary Imagineers did an amazing job putting together a menu with many delicious and unique allergen-free meals. First, it’s a bit different from most other quick service locations, which is probably due to its Asian influences. First, you select your protein, like chicken, beef, tofu or shrimp. The chicken and beef are wood-grilled at a station visible upon entering the canteen. The tofu is chili-spiced and fried. Next, you select a base, such as rice or noodles, then you pick a sauce. They also have a list of combinations to make ordering easy. See the menu for the full list. Our favorite is the chicken, rice and bean sauce, which is more of a mildly spicy vinaigrette sauce. It’s delicious and we always ask for extra. This option is straight off the menu and is free of dairy, peanut and tree nut. However, we still specify our allergies when ordering. They do have an allergy menu, of course. However, after discovering this fantastic combination, we only consult it to make sure nothing has changed. You may notice on the allergy-friendly menu, most of the options are the same across allergen categories, except for fish/shellfish and soy. 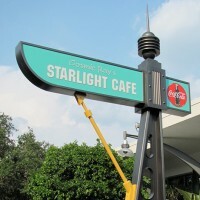 As a Disney World Passholder, we have the luxury of entering a park just for a meal. 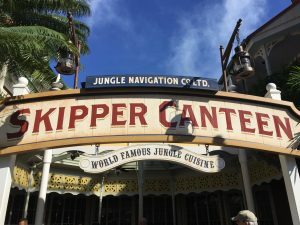 On this last trip to Disney World, we made the trip on the fabulous Disney Transportation System bus all the way to Animal Kingdom just for lunch at Satu’li Canteen. It is that good. Of course, we also stopped at Tamu Tamu for a Dole Whip. See the full menu here on the Disney website. This quick review was provided Gillian, whose daughter is allergic to dairy and egg. This was my daughter’s favourite meal all week. Chef Jason spoke directly to her and asked her what she wanted to eat. He prepared a gourmet safe burger with toppings of her choice- sautéed onions, pickles, lettuce and ketchup all on a safe bun served with fries and a glowing Ariel lemonade. The waiter was also happy to serve both of the kids apple slices (listed as a dessert) as a starter, and they brought out a safe chocolate ice-cream sundae. She loved her meal here. There was one minor hiccup here…for some reason a busser/different waiter delivered a bowl of pickles and mayo to the table where she was sitting. Not sure if that is a standard delivery or was a mistake meant for another table, but in the dark it could have easily been missed or mistaken and accidentally consumed by my daughter if she was younger or less aware. The darkness in this venue and the way the cars are set up (kids in front, parents in back) may be uncomfortable for some allergy parents, as it makes it more challenging to see and inspect the food being delivered and eaten. 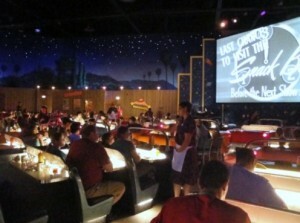 If you would like to review Sci-Fi Dine-In Theater or any Disney restaurant, submit a food allergy dining Quick Review. Our flight landed earlier than expected and we were able to get a last minute unplanned walk-in seating at this restaurant for lunch. My initial impression of this place was very good. I spoke with the host about whether they could accommodate my daughter’s egg and dairy allergy and they showed me an allergy menu that had several options for those restrictions. The seater who walked us to our seat even asked if the restaurant crayons and cutlery were safe for my daughter to use. However, on the walk to the table she commented on how sad it is for kids to have allergies and how much they miss out on. While I know she was trying to be kind it was a very negative way to start our trip as one of the reasons we love Disney, is because we don’t feel we miss out on anything. The waiter and seater were more than happy to get the chef for us to speak to. The chef came out and we discussed how he could safely prepare the kids shrimp skewer meal and substitute fries for the rice. We agreed on a safe dessert option of Tofutti Ice-cream, Enjoy Life Cookies and Hershey’s Syrup. He said he would check the ingredients on the sprinkles to see if they were safe for her. He explained that they had a dedicated fryer to make the fries and the food would be safely prepared on a separate grill. At that point I was confident that she would be taken care of. That’s when things went unfortunately very wrong. A busser brought my daughter her meal to the table stacked underneath her sisters open cheese burger, this unfortunately transferred cheese residue all over the bottom of the plate. There was no allergy stick on the food. We waited to speak with the waiter who told us that they remove the allergy sticks before the food is served? Before we could even address the cross contamination issue we noticed that the order was incorrect…she had been sent brown rice instead of fries. The plate was sent back to the kitchen and I was told a new one would be prepared. Minutes later the skewer of shrimp returned with extra shrimp added to it and a pile of green beans and we were told we would have to wait for fries to be prepared. Concerned about the food, we inspected it closely and found penne noodles covered in an oily residue buried within the green beans. We decided to allow her to eat the shrimp only, which unfortunately by this time were cold and terribly over salted, and waited for the fries which were brought out 10 minutes later. I probably should have complained more but we were so tired and hungry we figured she could at least eat the dessert the chef had promised. Once again when dessert arrived it was not what was ordered. She was sent a bowl of Tofutti on a plate with Hershey’s M&M’s, Sprinkles and Syrup. I immediately noticed the M&M’s and pushed the dessert away. At this point the waiter, began adamantly stating that M&M’s were safe for dairy allergies. I literally had to google an ingredient list to show him that they contained milk and were not safe. He took them back to the kitchen and then came back and apologized, bringing me a bottle of brand new unopened Hershey’s syrup. The cookies never arrived. I asked to speak with the chef but was told he was too busy with the rush to speak to me about what happened. Instead the waiter offered free light out Tinkerbells and was very apologetic. We were very happy to have avoided what could have been a very serious reaction. However, the series of events that occurred during this meal service showed me that there were multiple places were further allergy training was required with the staff on duty at the time. We were very glad that this was our only disappointing experience of the entire trip. 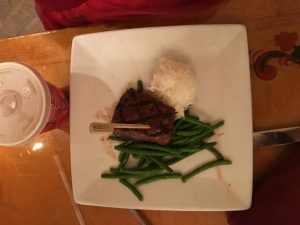 If you would like to review Captain’s Grill or any Disney restaurant, submit a food allergy dining Quick Review. A favourite dining experience for our whole family. My kids thought the whole show was hysterical. We were so excited to see that the “famous” Chef TJ would be looking after my daughter’s meal here and he did not disappoint. 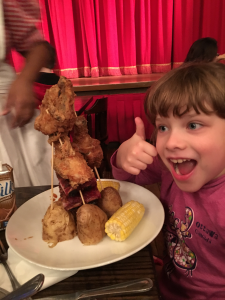 He made her a tower of safe foods including her first ever fried chicken, ribs, baked potatoes, corn and a bucket of fresh delicious salad with a safe specially made Italian dressing. Dessert was a huge tower of sugary delights, cookies and ice-cream topped off with cotton candy and syrup. It was a magical evening that won’t soon be forgotten or topped. If you would like to review Hoop Dee Doo Musical Review or any Disney restaurant, submit a food allergy dining Quick Review. Before dining at this restaurant I reviewed the menu and found on-line versions of the allergy menu so that I would have a good idea of what might be safe for my daughter ahead of time. It was a good thing I did, because we were told that there were no allergy menus available on that day. The waiter brought the chef who asked what she would like. He told us many of the proteins could be prepared safely. WE asked if the Tiki Tiki Fishy Fishy on the regular kids menu would be safe and he said it was and he would make sure she got some trainer chopsticks to eat it with! She was also able to have the feature frozen slushy from the menu and a full plate of Enjoy Life cookies. If you would like to review Skipper Canteen or any Disney restaurant, submit a food allergy dining Quick Review. We had a great experience here. The waitress offered to bring the chef to discuss safe options for my daughter. We ordered the beef off the children’s allergy menu and requested plain rice instead of mashed potatoes. It was delicious. 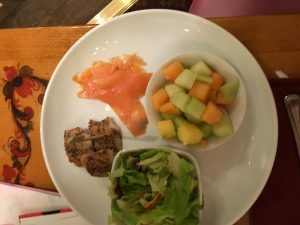 There was also a number of safe starter options from the buffet and the chef offered to bring her a plate of safe things to sample and make a garden salad with a simple oil and vinegar dressing. I thought it was great that he was willing to prepare several foods for her to try just like everyone else. We were surprised to find out that she loved the peppered Mackerel! There were also several safe options for dessert, but we had ordered a cake from Erin McKenna’s, so decided to pass on any other options here. This quick review was provided by Beth, whose daughter is allergic to dairy, egg, tree nuts, sesame, fish, and mustard. 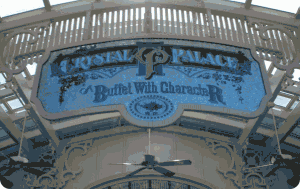 We had lunch at the Crystal Palace and had a wonderful experience. 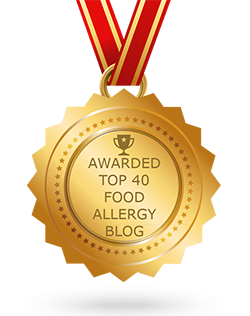 My daughter has multiple food allergies – and she was only 3 at the time – so finding something for her to eat is never easy. We let the server know about her allergies, and very soon thereafter, the chef came to our table to show me what was safe at the buffet. There were a few options, but of course she wanted something they didn’t have, a hot dog with french fries. The chef immediately told me that was not a problem at all; he would just ask the nearest restaurant with those items to send them over. He said they did that all the time and was happy to do so for us. We didn’t wait long at all, and she especially didn’t notice the wait because she was hugging all the characters. They brought her two hot dogs and a huge pile of french fries with a side of fruit. She was happy, and we all had a great time. 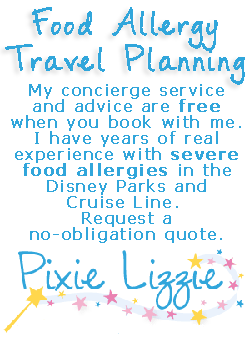 If you would like to review Crystal Palace or any Disney restaurant, submit a food allergy dining Quick Review. 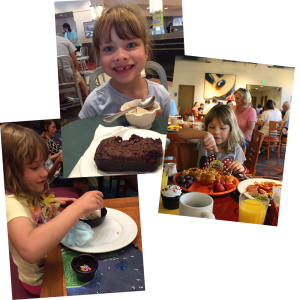 This trip report was graciously provided by Gillian, whose daughter is severely allergic to dairy and eggs. We’ve been home for 4 days now and I’m in Disney withdrawal. It didn’t help that we got a few flakes of snow this afternoon. Boo! 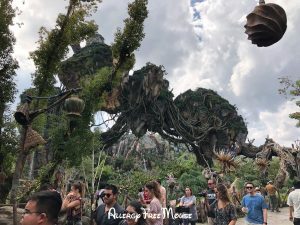 Anyway, since I still have Disney on the brain, I thought I’d take a few minutes to tell you how our trip went, and our experiences at the different restaurants with our daughter’s milk and egg allergy. Initially, it had been my intention to take proper photos and write some reviews, but I usually food we were so hungry by the time the food came, it always slipped my mind! Overall, we had a positive experience. 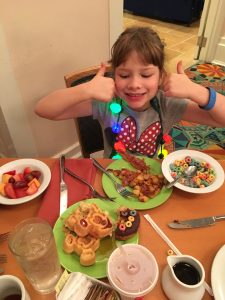 Our daughter did not suffer any allergic reactions, and we were able to find allergy safe snacks and treats around Disney. We found the table service restaurants all good at accommodating her allergy, though some offered more selection to her than others, and some chefs stood out more in their willingness to prepare something “special” for her. We did find the allergy menus were pushed on us, and in two cases the chefs refused to make anything not listed on the children’s allergy safe menu. (Ill elaborate in more below). At character buffets the chefs wanted us to walk the buffet with them, but when I said I didn’t want my daughter to eat off the buffet they always brought food directly from the kitchen without any further issue. We had multiple minor issues at QS places, which left be feeling frustrated and frankly nervous about trusting the kitchen staff.